On this blog back in June, we discussed our new miter construction polyester-wrapped door line. We're pleased to continue that conversation today with a fantastic new video from Olon Industries discussing this great new product (named NEXGEN™) in much greater detail, including its durability and environmentally conscious properties. We're proud to work with two Canadian partners on this product offering. The mouldings used to make the doors are manufactured by Olon Industries. Olon has corporate roots originating in Brampton Ontario and is currently headquartered in Georgetown Ontario. The door manufacturer that assembles the mouldings into five-piece miter construction doors for us is Multiwood, one of Western Canada's largest and finest door manufacturers. Multiwood's corporate headquarters and production facility are located in south Calgary. 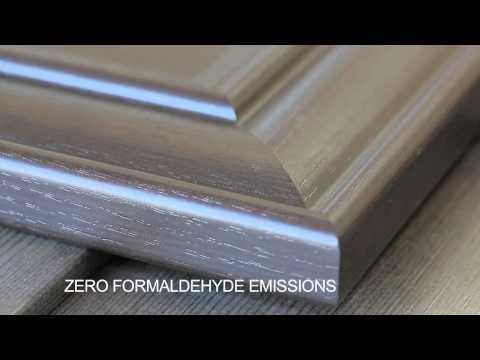 - NEXGEN™ doors are available in more than 50 door frame profiles and more than 150 colours. Classic Kitchens & Cabinets offers 7 of these profile/colour combinations (soon to be 9) as standard offerings for single-family home builders, renovators, and private clients purchasing through our sales and design centers. We also have access to the full lineup from Olon Industries, which allows us to provide colour/style combinations to suit the design requirements of any multi-family development. - The quick turnaround time from Olon Industries (1 week) is to our other partner for the NEXGEN™ product line (Multiwood). They turn Olon's wrapped mouldings into five-piece miter construction doors for us. In total, we are able to supply a custom-designed kitchen with NEXGEN™ faces from our single-family selection in as little as 3 weeks. For multi-family projects, once a colour and door style combination is confirmed, we are able to supply cabinets to site within 3 weeks of cabinet markout. - Classic Kitchens & Cabinets offers a comprehensive one-year warranty on all our cabinetry (including door/drawer faces, hinges/slides, and cabinet case construction) and installations. This includes adjustments during the first year to account for settling of the home. If you're interested in speccing this product for your home or development, we have samples of the 7 standard NEXGEN™ profile/colour combinations available for viewing in both our Calgary and Edmonton sales & design centers. Complete kitchens using NEXGEN™ cabinet faces can be seen in show homes by Trico Homes in the Calgary communities of Redstone, Nolan Hill, and Mahogany. Albums of all three of these show home kitchens can be viewed on our facebook page: Trico Homes - Mahogany - Bellwood, Trico Homes - Nolan Hill - Tamarack, and Trico Homes - Redstone - Aspen. Finally, one fun tidbit about the video: The host is Steve Maxwell, Canada's Handiest Man.